About 1 in 5 Transit Connects will be the "wagon" version, with windows in the sliding side doors and the rear load doors. The second-row bench seat splits, folds, and holds two or three additional passengers. If you can live without rear side windows behind the doors, the Transit Connect offers an alternative to smaller minivans like the Chevrolet HHR, Honda Element, or Mazda Mazda5. The 2010 Ford Transit Connect is unique in the market. Small-business owners will find it far more fuel efficient and maneuverable than a full-size van. The range of optional custom fittings lets users tailor it to their tasks. TheCarConnection.com has driven the 2010 Ford Transit Connect to bring you this hands-on review that covers styling, performance, safety, utility, and features from on-the-road observations. TheCarConnection.com's editors also researched reviews from other sources to give you a comprehensive range of opinions from around the Web-and to help you decide which ones to trust. High Gear Media drove a manufacturer-provided Ford Transit Connect to produce this hands-on road test. 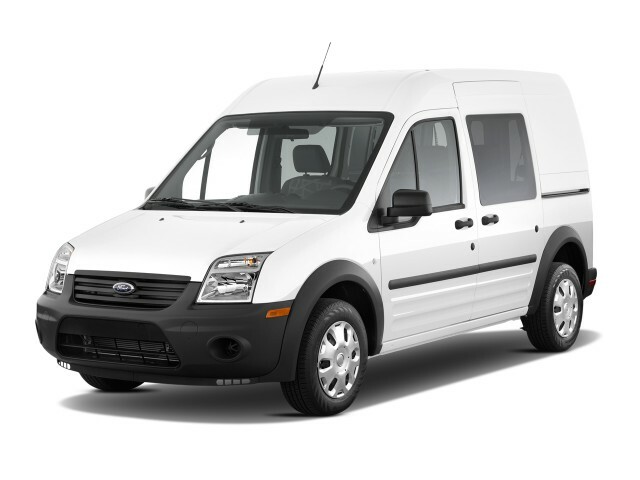 It's new to the United States for 2010, but more than 600,000 Ford Transit Connect small delivery vans have been sold in Europe and elsewhere since 2003. Ford brought the 2010 Transit Connect Stateside in the hopes of cultivating a small but loyal audience for the oddly endearing van; it plans to build the next generation in an American factory. Designed from scratch as a cargo vehicle, the Transit Connect comes in passenger and cargo versions, with seating for up to five, and carries a base price of $21,475. It's unique, but may compete most closely with the 2010 Honda Element, another cargo-hauling specialty utility vehicle, and the 2010 Chevrolet HHR Panel Van. There's not a lot to say about the styling of the Transit Connect. The front end is a variation on Ford's large headlights and horizontal-bar grille, but it looks like a small van, and it is. We suspect many will be painted white and quickly become an invisible part of numerous urban landscapes. Inside, the 2010 Ford Transit Connect betrays its European origins only occasionally. One example: The electric window switches are mounted on the center tunnel rather than on the doors. The 2010 Ford Transit Connect is powered by a 136-horsepower, 2.0-liter Duratec engine. It's mated to a four-speed automatic transmission driving the front wheels; the same powertrain is used in the Ford Focus. Acceleration off the line is hardly lightning fast, but it suffices for urban use. We didn't get a chance to drive a fully loaded version. Midrange acceleration is good, as are the brakes (discs in front, drums in the rear), which include anti-lock protection. While almost every European Transit Connect uses a diesel engine, Ford says altering a small diesel to meet stringent U.S. emissions standards would make that option prohibitively expensive for cash-conscious fleet owners. Sometime during 2010, Ford will launch an all-electric version of the Transit Connect. Its liquid-cooled lithium-ion battery pack will be offered in two sizes, producing a range of 70 to 100 miles on a single charge. Recharge time will be 6 to 8 hours. The payload of the electric version will be 1,400 pounds, a mere 200-pound reduction against the gasoline version. With fuel economy rated by the EPA at 22 mpg city, 25 mpg highway, the Transit Connect does far better than Ford's E-150 full-size van. The best-rated E-150 gets just 14 mpg city, 18 mpg highway from a 225-horsepower 4.6-liter V8. The 2010 Ford Transit Connect is hardly a hot-handling hatchback, but it's not meant to be. Delivery drivers used to wrestling full-size vans or larger box vans through city traffic will find it a joy. It takes a bit of training to avoid clipping curbs when making sharp turns, because the rear wheels are so far to the rear at the van's corners. For easy urban maneuverability, the curb-to-curb turning circle is just 39 feet, and the power-assisted rack-and-pinion steering makes it easy to park. The door mirrors are usefully large too, which is good, because even with windows in the rear "church doors," the center posts are a major blind spot in the inside rearview mirror. The 2010 Transit Connect feels smaller and more maneuverable on the road than it is. In other words, it drives small. That's a good thing, because it's remarkably wide inside-even holding two large construction workers comfortably. It's tall, too. Only the long wipers remind drivers just how high the windshield and truck actually are. That height, in fact, provides enough space for a full-width storage shelf above the windshield that holds books, clipboards, or even a small portable computer printer. Payload is 1,600 pounds, and there's 135 cubic feet of cargo space. The load bay is 6 feet long, 5 feet high, and 4 feet wide between the rear wheel arches, with a lift-over height of just 2 feet above the ground. Gross vehicle weight is 5,000 pounds. Befitting a vehicle likely to run with only two front passengers, the first-row seats of the 2010 Transit Connect are fitted with dual-stage front airbags and side-curtain airbags. Roll Stability Control is optional on cargo vehicles, though standard in the wagon that's fitted with a second-row seat. The body is double-skinned to lessen the damage from minor dings, and each wheel opening has a durable rubber trim molding. 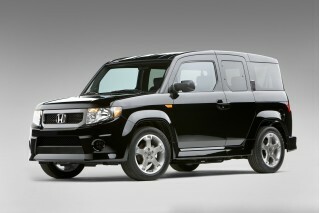 The hood can be locked along with the front doors and the cargo doors-which are keyed separately. Because the 2010 Ford Transit Connect is a commercial vehicle-albeit a small one-many near-standard features found on cars and crossovers aren't available. One regrettable omission is Ford's popular SYNC interface for audio and communications systems. The sole such offering is Bluetooth connectivity from Nokia. Neither is a 110-volt power outlet available. A Garmin navigation system is offered in place of the in-dash unit found on Fords meant for passengers. To accommodate the myriad special needs of small-business owners, Ford allows aftermarket companies to fit special-purpose "upfits" (cargo bulkheads, racks, drawers, bins, shelves, and other interior options) to Transit Connects as they come off the boat. That's also when Ford installs the in-vehicle computer and telematics tracking system offered as Ford Work Solutions. Options include an in-dash computer and the in-vehicle Tool Link system that keeps track of tools and other items fitted with RFID tags. These can be ordered with Crew Chief software that tracks the vehicle's location in real time, the length of time it spends idling, seatbelt usage, average speed, and how often hard braking occurs. An HP OfficeJet portable printer can even be added in order to print job specs and invoices on site. The rest of the options list is short, including rear doors that open at an extra-wide 255-degree angle, an engine-block heater for cold climates, and Roll Stability Control. 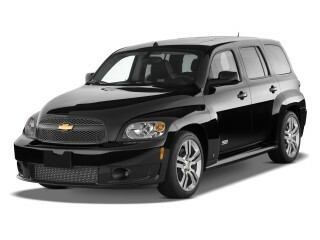 The base XL cargo version starts at $21,475, including destination charges. A fully loaded XLT wagon with all the Ford Works Solutions gadgets runs as high as $26,975. The 2010 Ford Transit Connect won’t be bought on the basis of its styling, which is functional and purposeful without being primitive. The 2010 Ford Transit Connect is one of the few vehicles other than full-size vans "specifically developed as a commercial vehicle," notes Autoblog. That makes it both distinctive, boxy-and unlike almost any other vehicle today. Leftlane News says the 2010 Ford Transit Connect displays "little of the swoopy pizzazz of the Fiesta or Mondeo," although it's worth noting that for commercial vehicles, form invariably follows function. Many reviews comment on the attention it attracts, with ConsumerGuide asserting it "doesn't look like anything else on the road." Motor Trend concludes the Transit Connect "will do the style- and efficiency-conscious business owner proud." Inside, Leftlane News calls the Transit Connect "pretty ritzy by commercial vehicle standards," although Consumer Guide criticizes the "Spartan interior materials." But then it is, after all, a commercial vehicle. The 2010 Ford Transit Connect offers good handling and maneuverability, as well as adequate power in town, where it will do most of its miles, but it strains on highways. The 136 horsepower and 128 foot-pounds of torque generated by the 2010 Ford Transit Connect's 2.0-liter Duratec four is "more than sufficient," says Jalopnik, though Leftlane News considers the power "middling" and calls the engine "not exactly the height of technology." Motor Trend agrees, deeming the Transit Connect engine "underpowered" and noting it "strains against the 3,500-pound van's light load." ConsumerGuide is harshest of all, saying that "passing and merging muscle is almost non-existent" at highway speeds, with "foot-to-the-floor acceleration" producing "a lot of sound and fury with nothing to show for it." Jalopnik notes the engine power is helped by "four well-chosen gear ratios" in the automatic transmission, but laments, "Sadly, a manual transmission won't be available" in the United States. The EPA rates the 2010 Transit Connect, which uses regular fuel, at 22 mpg city and 25 mpg highway. But "you may not come close" to those numbers, warns Motor Trend, because "your driver will be using a lot of throttle" merging into traffic. On a 900-mile highway trip, ConsumerGuide achieves 24.2 mpg in the 2010 Ford Transit Connect. Jalopnik says the front and rear sway bars "control body roll during brisk handling," and concludes the 2010 Transit Connect "drives as easy as a comparable front-wheel drive hatch." Leftlane News concurs, asserting the Transit Connect "rides firmly and compliantly" and gives "almost sporty handling." Road & Track points out the MacPherson strut front and solid rear axle/leaf-spring rear suspension doesn't "give the most comfortable street ride" but keeps lift-over height low at the rear for good cargo access. The Transit Connect's short 39-foot turning circle, says Motor Trend, lets it "make a delivery entrance back-alley U-turn." Leftlane News deems the steering "direct, well-weighted," and Popular Mechanics agrees, declaring the steering feel and response is "exceptional for a commercial vehicle." Motor Trend calls the brakes "firm" and "positive." The 2010 Ford Transit Connect focuses on its mission, with comfortable accommodations for the driver, a flexible and customizable interior, and surprising capacity for cargo. Because it was designed from the ground up to be a cargo van, the body design and cargo capacity of the 2010 Ford Transit Connect is highly functional. Leftlane News lauds the "minivan-style sliding side doors" and rear cargo doors that "optionally, open 180 degrees" (up to 255 degrees). Popular Mechanics calls the cloth driver's seat "unexpectedly comfortable" and praises its adjustable height, recline, and lumbar support, along with an "armrest on the right side." Leftlane News says the front captain's chairs are "easy to slide into" with good passenger legroom. The steering column also not only tilts, but telescopes. The low-volume, five-passenger Wagon model has a 40/60 split-fold rear seat and "reasonable leg room," notes Leftlane News, but the lack of rear side windows makes it "claustrophobic." If the 135-cubic-foot payload bay "were any more cavernous," says Popular Mechanics, "it would be inhabited by bats." The "impressive" 1,600-pound payload "should be ample for most users," adds Leftlane News. As in other commercial vehicles, Ford gives buyers access to "three suppliers who will fit the interior to meet the cargo needs of any business," according to Motor Trend, including a supplier that "applies logo wrap." Road & Track calls the interior shelving and organization system "excellent." And Leftlane News cites the "excellent accessibility with no compromises" provided by the low 20-inch lift-over height. Reviews say the 2010 Transit Connect is pleasant enough around town, but ConsumerGuide criticizes the "prominent engine noise" in highway cruising, which combines with "a lack of sound insulation in the cargo area" to give an "annoying resonance." The 2010 Ford Transit Connect does well on NHTSA crash tests, but the limited visibility inherent in a panel van body can pose major challenges for inexperienced drivers. As an urban commercial vehicle, the 2010 Ford Transit Connect will likely spend much of its time traveling at 40 miles per hour or less with only a single occupant. It scores well on the National Highway Traffic Safety Administration (NHTSA) front and side barrier impact tests, but has not yet been rated by the Insurance Institute for Highway Safety (IIHS). Front and side airbags are standard for front-seat passengers. The Transit Connect also comes with four-wheel anti-lock braking, tire pressure monitors, and automatic door locks. Electronic stability control is optional on Cargo models, but standard on the Wagon version. Daytime running lights are also optional. The main criticism in reviews of the 2010 Ford Transit Connect concerns visibility. USA Today sums it up: "Rear visibility was terrible, and that's with optional side and back windows." The "high driving position and tall windows" give "superb" forward visibility, says Popular Mechanics, noting that optional backup sensors "help with parallel parking," although Autoblog points out that the Transit Connect "isn't available with a rear-view camera." Motor Trend suggests most workers will "appreciate the ‘normal' seating position" that keeps drivers at eye level more with "tall cars and crossovers." The 2010 Ford Transit Connect is a basic, low-cost van with a remarkable array of options that can make it part of a carefully monitored, efficient commercial fleet. The base price of $21,475 for the simplest model of 2010 Ford Transit Connect comes with little more than air conditioning and a simple radio. The XLT model that starts at $22,300, says Popular Mechanics, "adds amenities like power windows and door locks," along with "keyless entry and cruise control," notes ConsumerGuide. The Transit Connect includes an auxiliary stereo input jack, ConsumerGuide continues, but the USB port "can't be used for a digital music player" but only drives containing data. As Jalopnik notes, the 2010 Ford Transit Connect "comes with a host of optional electro-wizardry." ToolLink uses RFID tags to keep track of tools inside the vehicle, which Popular Mechanics notes is "helpful for ensuring no tools are forgotten" at job sites. Motor Trend deems the $1,395 in-dash computer "the most versatile option," noting it includes remote desktop-access software, a hands-free phone, and a Garmin GPS unit, which ConsumerGuide says "strays from the Ford norm" for navigation systems. An optional wireless keyboard and printer can be stored in the full-width shelf above the windshield. The Crew Chief vehicle tracking integrates what Popular Mechanics calls a "boss-is-watching GPS device" to report on throttle position, vehicle speed and location, seatbelt usage, and even excessive idling. ConsumerGuide notes that neither satellite radio nor the Ford Sync voice-activated control interface is available. At the end of the day, while driving the $21,475 Transit isn't terribly exciting, says Road & Track, if you own a business, "the benefits to your bottom line will be."